There are lots of ways you can preserve flowers, including drying them and pressing them. This project crystallizes a real flower. It works for any flower, though I especially like how it turns weeds into works of art. It only take a few hours to grow the crystals. Use fresh or dried flowers for this project. It will work fine on silk or plastic flowers, too. You can color the flowers, but even if you don’t add dye, the borax will absorb natural tints from the petals, resulting in a muted color crystal. First, find a container big enough for the flower head. Remove the flower from the container. Pour very hot to boiling water into the empty container. Stir in borax until it stops dissolving. This is the point when you start to see a little undissolved borax powder in the liquid. Add a few drops of food coloring, if desired. 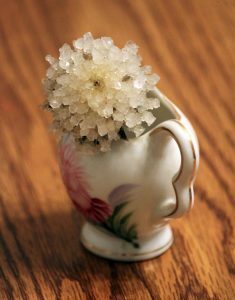 You could also add essential oils, if you want to scent the crystal flower. Immerse the head of the flower in the borax solution. Some flowers float, so you may need to place an object on top of the flower to keep it submerged. Allow a couple of hours to overnight for the crystals to grow. Remove the flower from the liquid and set it on a paper towel to dry. Place the flower in a decorative vase and bask in its beauty. If the stem of the flower is weak, you may wish to insert a wire or stick to help hold the flower upright. The crystal flower requires no water or other care, except perhaps a light dusting from time to time. Enjoy your real crystal flower! Definitely! You could use sugar or Epsom salt or any other household chemical that forms crystals. Hello, Loved the idea! But how much Borax did you used? For the one in the photo, I microwaved about half a cup of water until it was boiling and then just stirred in borax until it stopped dissolving. Hi there, I’m working on a project and was wondering if the flowers could dissolve after being crystalized? The crystals could dissolve, but the flowers probably would not. So could I essentially crystalize anything I could submerge in the solution (for example, paper or canvas for an art project)? If so, would the crystals absorb any colors I used on the paper or canvas?